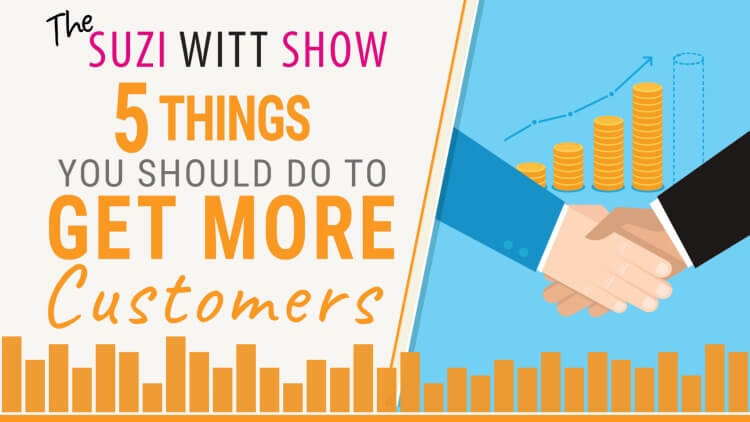 In episode 11 of the Suzi Witt Show, I am talking about how you get more customers. For any small business, getting new customers through the door can be a really tricky task. And unfortunately many businesses end up putting customers off without even realising it. Listen in to find out my top 5 tips for attracting new customers to you business. Find out how you have to learn how to approach customers the right way and how many businesses actually scare off customers without even realising it. Find out 5 things you can do to improve your messaging so that customers find your business more attractive. Understand more about why looking back will sometimes give you the answers that you can implement for a brighter future. Check whether you are actually using social media in a way that will help you find customers (not friends). Learn my simple method for expanding your business without spending any money on hiring staff.